Forest is a long horizontal drawing I created using black paper and white pencil. It debuted in 2013 at LxWxH Gallery in Seattle, USA where the full thirty foot span (9.14 meters) was on view. This panning video of Forest was made in collaboration with Australian composer and sound artist, Alan Lamb. It features his ethereal piece "Beauty" from the album Primal Image. The music for "Beauty" was made using contact microphones attached to kilometer (0.62 miles) lengths of stretched telegraph wire. The telegraph wires acted as the strings of a wonderfully large aeolian harp that was played by the wind and weather outside in rural Baldivis, Australia. - Thank you, Robert Campbell for your expertise animating a smooth panning video of Forest. - Thank you, Sharon Arnold for providing a perfect thirty foot gallery wall to exhibit Forest full view. 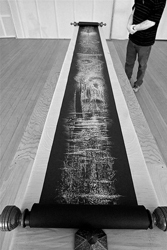 Scroll, a white pencil drawing on black paper measuring over 10 feet in length, debuted in April 2011 at Amo Art. - Video editing by Jeff Cerar / 4th Wall Films. - Music permission for Animal Collective's "Visiting Friends", specifically for "Scroll", granted by Animal Collective, Rough Trade Publishing, and Fat Cat Records. © 2016 by Bette Burgoyne. Permission to use images easily granted solely upon review of request.